Wild Dunes on the Isle of Palms is South Carolina’s premier island resort. A vacation to this dreamy destination means days filled with world-class golf, sunny beaches, delicious restaurants, outdoor recreation, and plenty of relaxation. Whether you’re dreaming of the ultimate golf getaway or a fun-filled family vacation, here’s how to plan the best Wild Dunes trip. As you’re making plans for your Wild Dunes, Isle of Palms, getaway, start by accessing the ultimate IOP Vacation Guide. This carefully-curated guide includes all the information you need on the best outdoor activities, restaurants, shopping, and attractions in town. You’ll discover exactly which things to include on your Wild Dunes trip! Just a 12-minute drive from Charleston, Wild Dunes Resort is located at 1 Sundial Circle, Isle of Palms, SC, 29451. With year-round activities, convenient access to the beach, and premier golf courses, Wild Dunes is a wonderful vacation destination. Learn all about the resort below and then book the perfect vacation rental with East Islands Rentals! You won’t be short on ways to spend your time at Wild Dunes. With two oceanfront pools, tennis courts, a fitness center, award-winning restaurants, the Sand & Sea Day Spa, and a range of activities for kids, the island resort is full of activities for all kinds of guests. Visit the Wild Dunes Resort website for a complete list of amenities and activities. Wild Dunes offers some of the best Isle of Palms golfing. With two outstanding courses, the Harbor Course and the Links Course, Wild Dunes Resort is considered among the top golfing destinations in the state. The Harbor Course offers an exciting and challenging design that weaves around lagoons, salt marshes, and the scenic Intracoastal Waterway. The Links Course also features an excellent design along with stunning views of the Atlantic Ocean. Don’t worry about choosing, you’ll have plenty of vacation time to enjoy both fabulous golf courses! If you’re looking for the best Wild Dunes, Isle of Palms condo rentals or resort rentals, look no further than the fabulous Vista Mare at East Islands Rentals. This stunning, oceanfront home is located in Wild Dunes and offers panoramic ocean views. Enjoy spacious rooms, comfortable furniture, charming decorations, and an elevator that conveniently takes you to all four levels of the home. Also included in your rental is access to the Grand Pavilion pools, which are just steps away from your door! Along with Vista Mare, we have several other amazing properties at East Islands Rentals! All of them offer convenient access to Wild Dunes and the best Isle of Palms activities and attractions. From oceanfront rentals to vacation homes with a private pool, we have a place for everyone here. 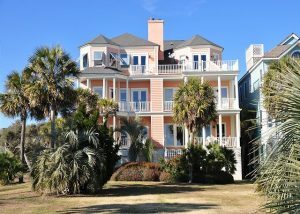 Browse all East Islands Rentals properties and start planning the perfect Isle of Palms getaway! We look forward to hosting you.